I just love that I'm enjoying chicken with crispy skin again like I used to as a kid. Thankfully the low-fat fallacy is dead and we're all eating food that tastes amazing again. 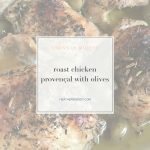 This recipe sounds fancy but it really couldn't be an easier recipe for a quick yummy weeknight dinner. 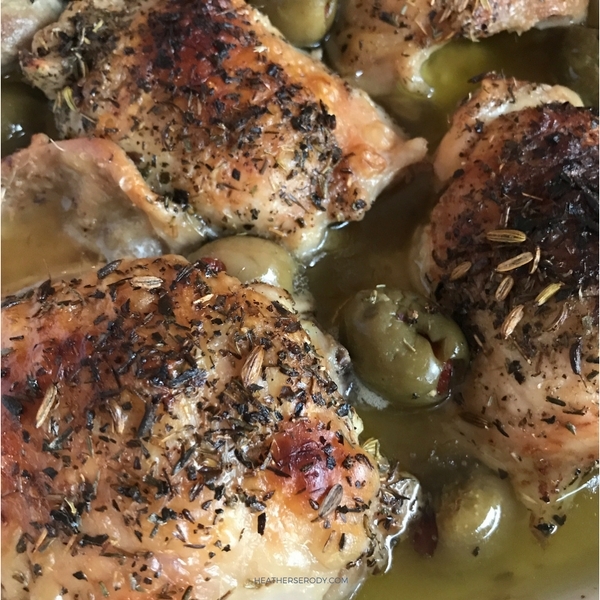 Just nestle a package of organic skin-on chicken thighs in a baking dish, add a few glugs of EVOO, juice of half a lemon a squeeze of lemon, a tablespoon of loose Herbs De Provence seasoning and 8-10 green olives – I love French Picholines. If you don't have any pre-made Herbs De Provence you can approximate it by using your own combination of dried thyme, savory, oregano, marjoram, and lavender if you have it! p.s. When the chicken is done, I turn off the oven and let the skin really brown under the broiler for just a few minutes to get the crispiest skin I can. 15 turns of freshly ground black pepper @1/4-1/2 tsp. Place thighs in a rectangular baking dish, skin side up. Drizzle with olive oil and lemon juice, rubbing it all over the top of the chicken. Season the chicken with salt and pepper. Generously sprinkle with herbs until chicken is evenly coated. Tuck olives in between thighs. Roast in the oven about 30-40 minutes (check as ovens vary) or until the chicken is very crisp and the meat cooked through. For extra crispy skin place the chicken under the broiler for just a minute or two. Serve immediately from the pan or on a warmed platter.